In this portion of the EXCEL Beef Plant tour, EXCEL Beef Plant starts in the coolers and viewers learn the role of a federal meat grader in determining Choice and Prime-grade carcasses. Then, it moves to the disassembly process on the fabrication floor as a highly skilled team of workers and ergonomically designed machines work together to process 8,000 sides of beef into �boxed beef� at a rate of more than 100,000 pounds per hour. 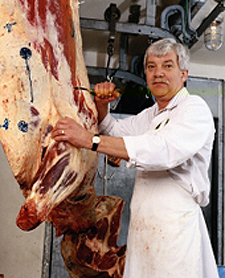 Viewers watch as the carcass is fabricated into primal and sub-primal cuts� an excellent lesson in beef cut identification in itself. Also viewers see the transformation of beef by-products into usable and saleable items. The viewer visits one of EXCEL's most modern and efficient beef packing plants, and takes a closer look at packaging, storage, and shipping.